Garda search team at the scene in Bray. GARDAÍ ARE CONTINUING to search the Bray harbour area this morning following yesterday’s shooting which left one man dead, and another two injured. Gardaí have been carrying out searches of the area, and the harbour pier since 6am this morning. They are now focusing their investigation on the silver coloured Volkswagen Caddy that the gunman fled the scene in. The cars of the three victims remain at the scene in Bray today. Gardaí are now tracing the steps of the gunman and said they are still trying to establish a link between the van and the scene. They are appealing to anyone with information who might have seen the vehicle yesterday. The area will remain cut off for some time, said the gardaí, and there is no indication as to when it will reopen. Tributes have been paid to Bobby Messett, a grandfather and fitness fanatic who was attending a training session when he was shot shortly before 7am yesterday morning. Pete Taylor – the father and former trainer of Irish boxing champion Katie Taylor –sustained injuries to his arm and chest in the incident. Another man, Ian Britton, was shot three times in the leg. Messett, who was 50, is believed by gardaí to be a completely innocent victim who was in the wrong place at the wrong time. Early indications suggest this attack could be linked to a side business Taylor is a part of. Sources said that Taylor had fallen out with a local criminal who he had befriended in recent years. There is no suggestion Pete Taylor, or anyone else in the gym at the time, is involved in any form of criminality. The area outside the Bray Boxing Club remains cordoned off this morning and there is a large garda presence at the scene. Police are looking to trace the movements of the silver coloured Volkswagen Caddy van with Northern Irish registration which was used in the shooting. Shortly after the shooting, the gunman, who had his face covered drove the van from Bray through Shankill and the Cornelscourt area before being abandoned on Pigeon House Road at approximately 8.05am yesterday morning. The male was seen leaving the van and cycling away. 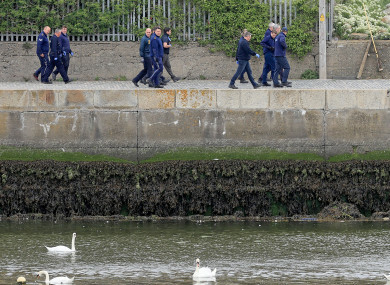 Email “Garda team searching Bray harbour area after boxing club shooting ”. Feedback on “Garda team searching Bray harbour area after boxing club shooting ”.